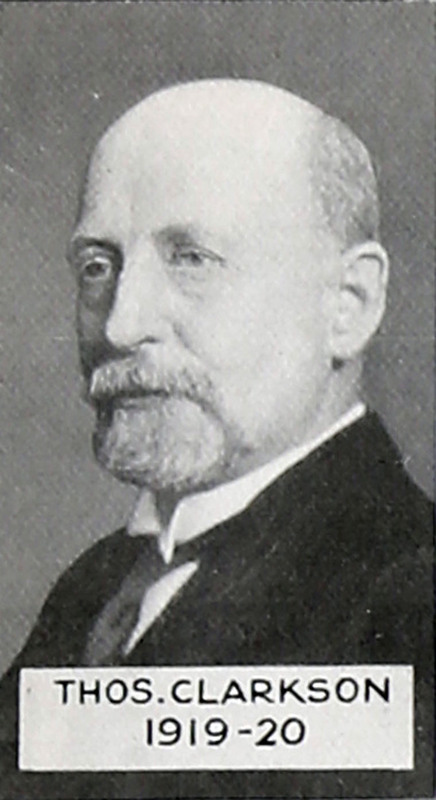 Institution of Automobile Engineers President 1919-20. Thomas Clarkson (1864-1933), inventor of steam buses, the thimble-tube boiler and the Clarkson Steam Motor. 1887 Trained as mechanical engineer in Manchester. Appointed Lecturer on Metallurgy, and instructor in assaying at King's College, London. 1891 July 11th. Married Alice Catherine the daughter of Walter Wakeford, Wholesale Mantle Manufacturer. Thomas Clarkson is an Engineer of 18 Neville Street and the son of Thomas Clarkson a Retired Cotton Spinner. 1895 Began adapting steam engines for use in automobiles. 1896 Joined by Mr. Herbert Churchill Capel, of Dalston, forming the Clarkson and Capel Steam Car Syndicate, which continued the development work at Chelmsford. Offered improved components for steam engines for road vehicles, including the Clarkson burner, condenser, and automatic lubricator. 1899 Capel and Clarkson visited the United States, where they negotiated the sale of the American rights of their various patents relating to oil burners, generators, and coolers for steam motor cars, etc. 1899 Capel died; Clarkson continued the company as MD. 1903 Thomas Clarkson designed a steam bus for Torquay; he was MD of Clarkson and Capel Steam Car Syndicate. The first buses were called Chelmsford after the Essex town in which they were made. Later buses carried the Clarkson name. 1904 two Chelmsfords ran for the Sussex Motor Road Car Co between Worthing and Pullborough. After this phase ended he began to design an improved steam lorry. 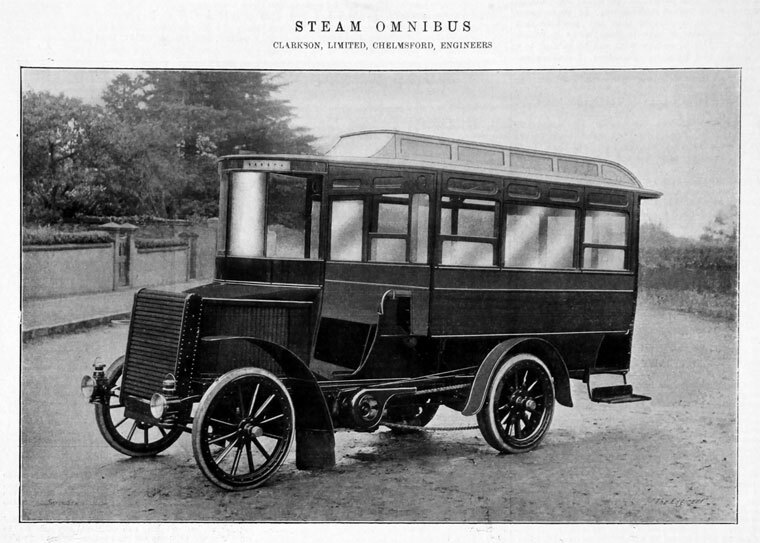 1909 Thomas Clarkson started the National Steam Car Co to run steam buses in London in competition with the London General Omnibus Co.
1909 the London General Omnibus Co withdrew its steam fleet. 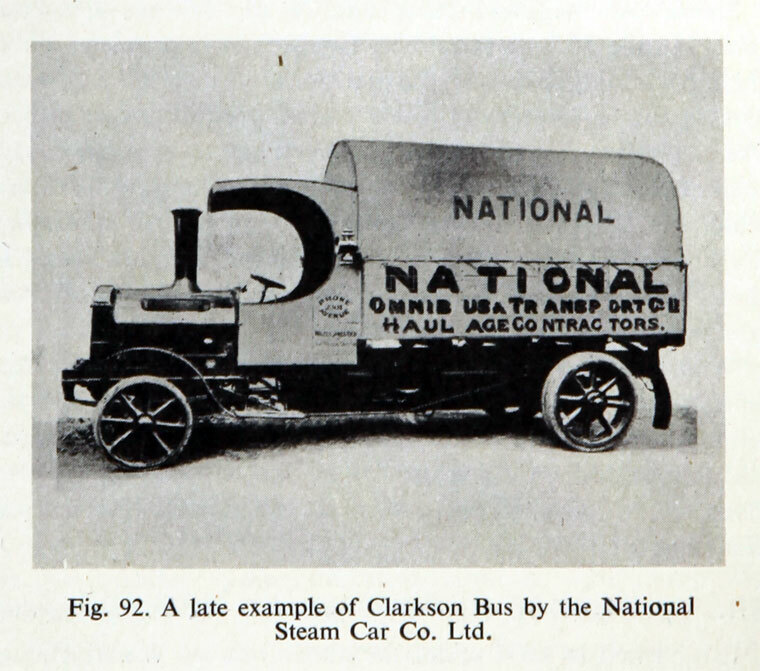 With help from friends, Clarkson formed his own company named the National Steam Car Co.
1911 A visitor in the house of Frederick Gale, Ashcote, Kingsfield Road, Watford; Thomas Clarkson (age 46 born Salford), Civil Engineer and Managing Director of Motor Omnibus Company. Widower. An arrangement with the London General Omnibus Co saw that the last one was withdrawn in 1919. By 1914 The National Steam Bus Co had 173 steam buses in London and Chelmsford. 1916 of Woodlands, Galleywood, Chelmsford. Patent relating to feed water apparatus. 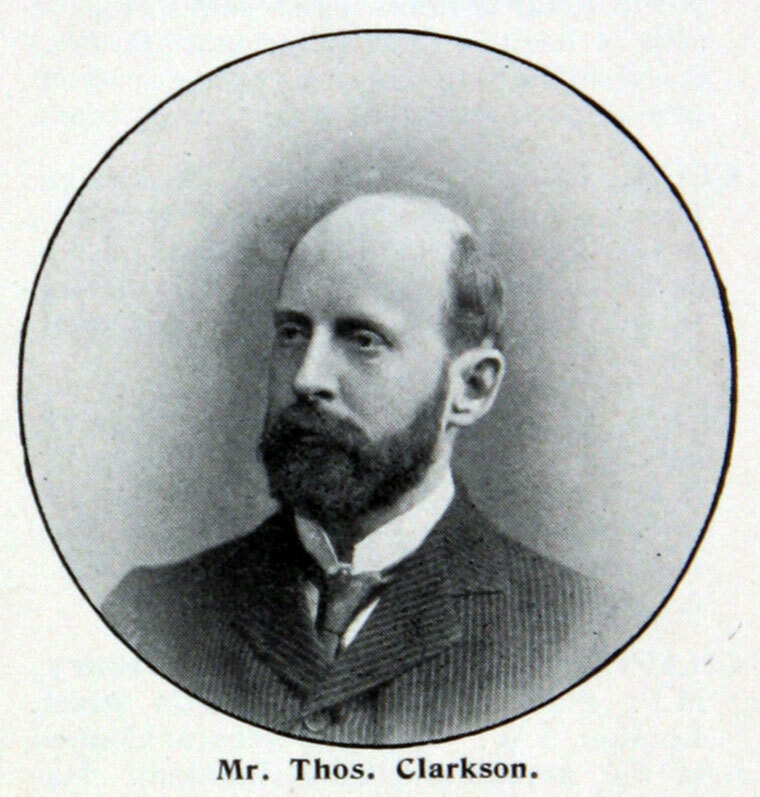 Thomas Clarkson was born in 1864 and received his technical education at Manchester Technical School and Owens College, subsequently taking a three years' course at the Royal College of Science. He was then appointed Lecturer in Metallurgy at King's College, and in 1891 became Engineer to the Clarkson-Stanfield Concentrator Co. It was after this that he began the series of experiments in the use of steam for road vehicles, which eventually led to the establishment of Clarkson, who specialised in the production of engines and boilers for cars. In 1909 he founded the National Steam Car Co, and later became one of the leading consultants in the country on steam vehicle questions. He was the designer of the thimble-tube boiler and of the Clarkson steam motor. He was elected a Member of the Institution of Automobile Engineers in 1913, joined the Council in 1916, and was President during the Session 1919-20. He had attended a Council Meeting only a few days before his death, which occurred suddenly on 3rd April, 1933, at the age of 68. THOMAS CLARKSON was trained as a metallurgist, but later turned his attention to steam-propelled road vehicles, and developed the well known thimble-tube boiler, which is now used in waste heat recovery from marine oil engines in the largest motor vessels. He was born in 1864 and received his education at Owens College, Manchester. He served as an apprentice from 1877 to 1884 with Messrs. T. Larmuth and Company of Salford, manufacturers of air compressors and mining equipment. In 1885 he obtained the Senior Whitworth Scholarship and a National Science Scholarship, and became a student at the Royal School of Mines, where he was later made an assistant in the metallurgical laboratory. In 1888 he was appointed demonstrator of metallurgy at King's College, London, and three years later became engineer to the Clarkson-Stanfield Concentrator Company. He then began his development of the steam road vehicle, and in 1897 he became managing director of the Clarkson-Capel Steam Car Syndicate. Six years later he took up a similar position with Messrs. Clarkson, and in 1909 founded the National Steam Car Company, holding the posts of managing director and engineer-in-chief. The firm ran a fleet of steam omnibuses in the London district; the vehicles were fitted with paraffin-fired boilers, generating steam at 300 lb. per sq. in., which was superheated to 800 deg. F. and supplied to a small twin- cylinder condensing engine. 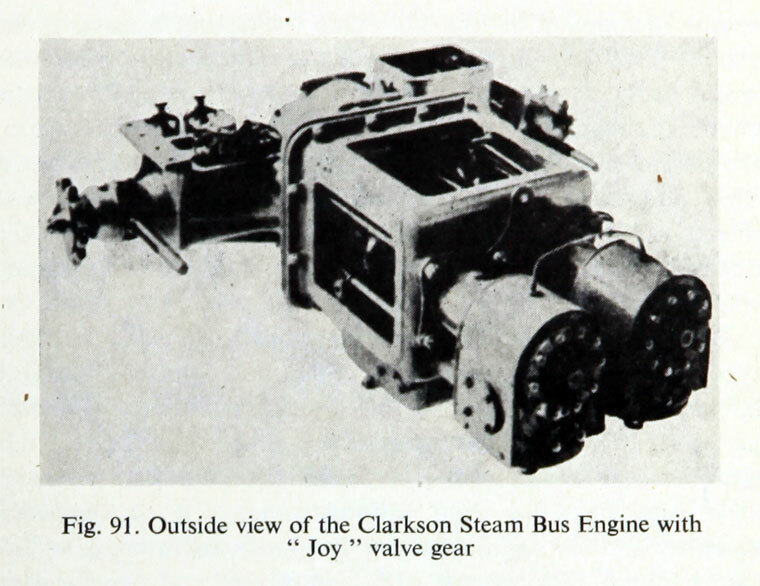 Later Mr. Clarkson developed a commercial steam vehicle with the semi-flash thimble-tube boiler which now forms an important part of the plant on motor vessels; the vehicle had a great influence on the subsequent design of steam lorries. He was the author of several papers on steam vehicles as well as metallurgical subjects, including "Steam as a Motive Power for Public Service Vehicles," which he read before the Institution in 1906. He attended the Canadian Summer Meeting of the Institution in 1932 and was to have given a lecture thereon at Hastings on 3rd April 1933, the day on which his death occurred. He had been a Member of the Institution since 1891 and was also a Member of the Institution of Civil Engineers.